I’ve done a couple of little projects this week…stuff that’s been stuck on my to-do list while I was busy making quilts. First up was a new crib sheet for Sophie using this tutorial. I’m never buying a crib sheet again…it literally took me 20 minutes. Next up was a purse. She’s been carrying around a plastic Target bag with her treasures in it for weeks…so it was time to get this bag lady a real purse. Now it holds all her treasures + bits of trash she collects, and I clean it out when she’s not looking. I swear I blinked and she turned into a toddler…it’s so sad and so much fun at the same time. 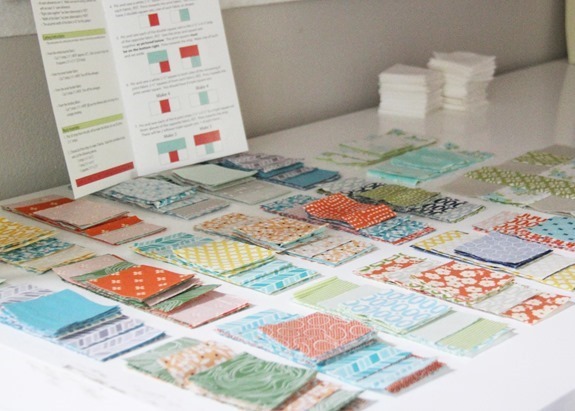 Now onto the next big thing…I can only take one or two “small” projects before I’m itching to make a quilt! All laid out and ready to sew! I’m making this quilt again… (pattern is here) without borders and 12 more blocks to make it 60” x 70”. 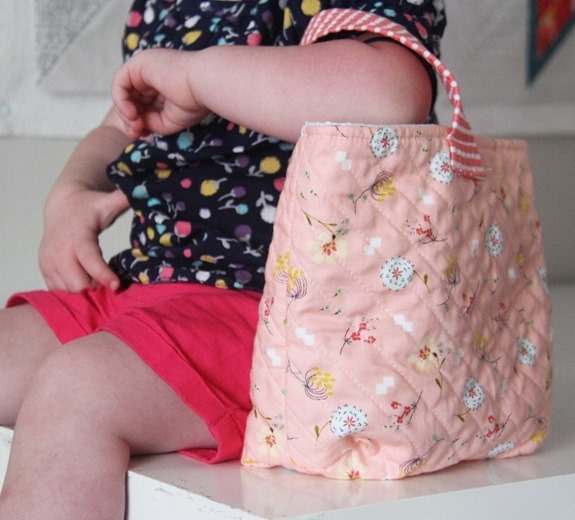 To make it like this you’ll need 42 – 2 1/2” strips of fabric, and 1 3/4 yards of neutral fabric. Wow that is an effective quilt. Um, purse tutorial, please! That is super adorable. where did you find that cute stack of fabric? I like that gray. Sophis is big enough for a purse? I can't believe that!? Wow, time flies. Our babies gow up so fast! I love your fabrics you used in her bag. I absolutely love those squishy little feet! Thank you so much for passing along the crib sheet tut. I will get on that right away! 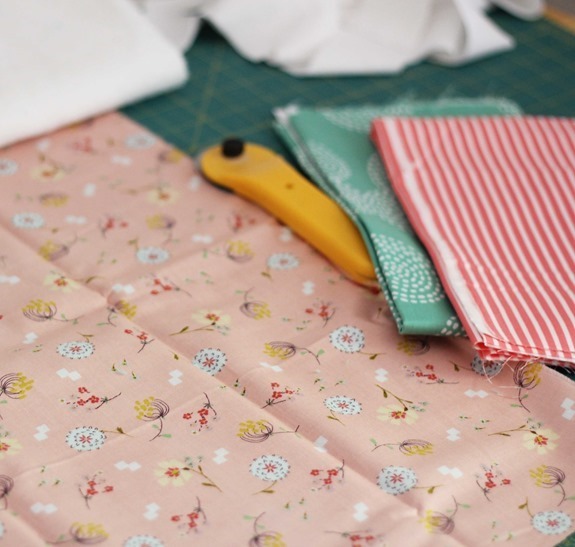 I'd never even thought of making a crib sheet but it's so sweet – and even though it would probably take me more then 20 mins it wouldn't be that much more for something so much prettier than boring white – and the perfect excuse for more lovely fabric! I love making my little boy's crib sheets too (even flannelette ones for winter time). 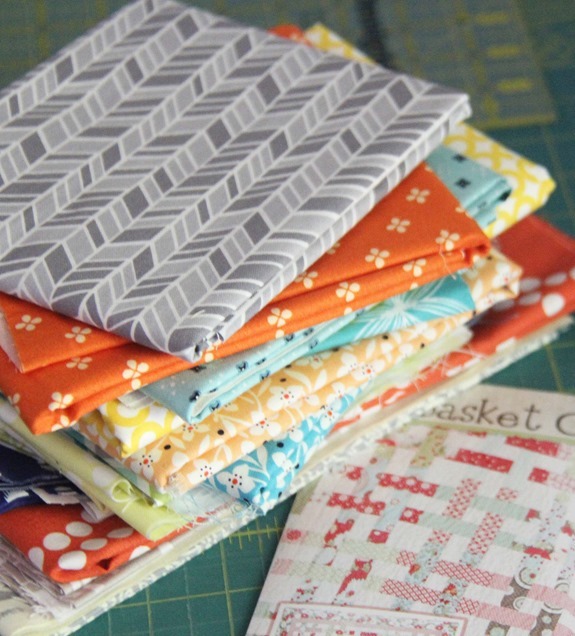 I LOVE the look of the fabrics for Sophie's quilt (gorgeous! ), cannot wait to see it once it's done! Making your own cot sheets is the only way to go. I've even made fitted sheets for our queen size bed. Fab pattern and lovely fabrics too! I have your pattern for Basket Case tucked in Moda's Salt Air collection. It's on my list to accomplish this year. Oh oh. Retreat project!!! Just purchased your pattern (yea for sale!) and i have a jelly roll and background fabric. Now if November would hurry up and get here!! Can NEVER get enough of Miss Sophie. Love that little bag. And those sheets – it's on my Grandma list. I spy some Cloud 9 and DS quilts fabric! I've been eyeing that gray and I think it's time to get some. I'm just disappointed I missed out on the trees with the blue birds in them, so cute. Looking forward to seeing your finish. She is so adorable! I love the little baby legs in the first photo. My youngest is almost 4 now. It's so bittersweet watching the last one growing up. Sigh! Have a super day! You're obviously trying to kill me with pics of those chubby feets. You need to tell that girl to stay a baby! Sheets are very easy. When I had our first daughter, I made flannel sheets as I couldn't find them here. We are in MN so it does get a little cold here in the winter. Little bag is cute too. What did I like best about your post? 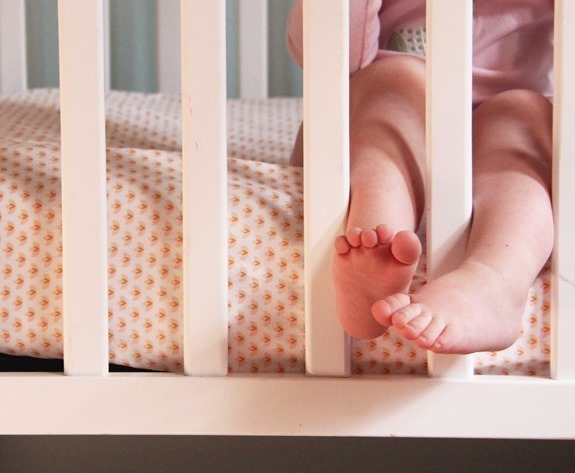 Those little feet sticking out of the crib! I just love toddler feet. I'm sure Sophie is thrilled with her new bag. Love the little purse! I bet she'll have a ton of fun filling that up! Adorable purse! I made my little one's crib sheet after much procrastination and I also couldn't believe how easy it was. I plan to make all of them from here on out, an they make great baby shower gifts too. Oh, I get that small project versus quilt attitude! I was thinking the same thing about N last week. And he's such a stereotypical boy. Walks around with a car or truck in his hand all the time. I can't wait to see that quilt with the fabrics you choose. I'm sure it's going to be gorgeous, as always. can you tell us some of the lines of fabric in the stack? (i know it's not all the same line). love the oranges, greys & the sweet litte florals. bet the end result will be precious~ can't wait to see it! Oh you've inspired me to want to try a fitted sheet myself! I have a little girl that looks like she's about the same age as your little girl. Mine's the 3rd child, first girl too! They look like they like and do a lot of the same fun things (maybe the same crazy screaming tantrums too!). Thanks for sharing your inspiring ideas. How much fabric did you need for that crib sheet? I stupidly bought extra deep pillow top mattressses for both of my sons' beds. I can't find any twin sheets deep enough so I always have to buy two full flat sheets and alter them into a flat and fitted sheet for these crazy beds… And I always have trouble getting the elastic to look nice — not sure if I'm overstreching it as I apply it (with my serger) or if I'm just not buying the right kind of elastic? Anyway, I love that little purse. I'll bet she's delighted with it! I like the way you present your quilts, thanks for sharing so lovely quilts. I would love the tutorial for the purse. It looks perfect for a toddler. Hi. I just found your quilting site. I design and print for sale quilt blocks. However, I could not quilt if my life depended on it! But, I am a willing student. I would love to use some of my quilt blocks to make my own quilt. I will keep watch on your blog. Interesting and I hope to learn!